The golden lion tamarin (Leontopithecus rosalia, Portuguese: mico-leão-dourado Brazilian Portuguese: [ˈmiku leˈɐ̃w̃ dowˈɾadu]), also known as the golden marmoset, is a small New World monkey of the family Callitrichidae. Native to the Atlantic coastal forests of Brazil, the golden lion tamarin is an endangered species with an estimated wild population of about 3,200 individuals spread between four places along southeastern Brazil, and a captive population maintained at about 490 individuals among 150 zoos. The golden lion tamarin has a very limited distribution range, as over time they have lost all but 2%–5% of their original habitat in Brazil. Today, this tamarin is confined to three small areas of the tropical rain forest in southeastern Brazil: Poço das Antas Biological Reserve, Fazenda União Biological Reserve, private land through the Reintroduction Program. The first population estimate made in 1972 approximated the count at between 400 and 500. By 1981 the population was reduced to less than 200. Surveys from as recently as 1995 suggest that there may only be at most 400 golden lion tamarins left in the wild. Tamarins live along the far southeast border of the country in the municipalities of Silva Jardim, Cabo Frio, Saquarema, and Araruama. However, they have been successfully reintroduced to the municipalities of Rio das Ostras, Rio Bonito, and Casimiro de Abreu. Tamarins live in coastal lowland forests less than 300 m (984 ft) above sea level. They can be found in hilltop forests and swamp forests. Additionally, this deforestation and fragmentation also leads to demographic instabilities, and an increased probability of inbreeding, consequently leading to inbreeding depression and a population decline. 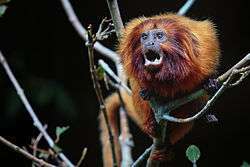 In the case of inbreeding, the problem lies in the increase of the isolated fragments where golden lion tamarins live. Inbreeding leads to low levels of genetic diversity and has a negative effect on survivorship; inbred offspring have a lower survivorship than non-bred offspring. Fragmentation leads to a decline in dispersal and as a result, a decline in breeding with individuals of other groups. Consequently, inbreeding depression is observed in these populations. With delay breeding, the decrease and shortage of territory puts pressure on golden lion tamarins to disperse in order to find necessary resources and areas suitable for their survival. However, dispersal is risky and requires a lot of energy that could have been used for reproduction instead. ↑ Groves, C.P. (2005). Wilson, D.E. ; Reeder, D.M., eds. Mammal Species of the World: A Taxonomic and Geographic Reference (3rd ed.). Baltimore: Johns Hopkins University Press. p. 133. OCLC 62265494. ISBN 0-801-88221-4. ↑ Rylands AB & Mittermeier RA (2009). "The Diversity of the New World Primates (Platyrrhini)". In Garber PA, Estrada A, Bicca-Marques JC, Heymann EW & Strier KB. South American Primates: Comparative Perspectives in the Study of Behavior, Ecology, and Conservation. Springer. pp. 23–54. ISBN 978-0-387-78704-6. 1 2 3 4 5 Kierulff, M.C.M. ; Rylands, A.B. & de Oliveira, M.M. (2008). "Leontopithecus rosalia". IUCN Red List of Threatened Species. Version 2008. International Union for Conservation of Nature. Retrieved 1 March 2009. 1 2 "Current status of golden lion tamarin". National Zoological Park. Retrieved 26 March 2012. ↑ Kleiman DG, Hoage RJ, Green KM. (1988) "The lion tamarins, Genus Leontopithecus". In: Mittermeier RA, Coimbra-Filho AF, da Fonseca GAB, editors. Ecology and behavior of neotropical primates, Volume 2. Washington DC: World Wildl Fund. p 299-347. ↑ Garber, P. A. (1980). "Locomotor behavior and feeding ecology of the panamanian tamarin (Saguinus oedipus geoffroyi, Callitrichidae, Primates)". International Journal of Primatology. 1 (2): 185–201. doi:10.1007/BF02735597. ↑ Sussman RW. (2000) Primate ecology and social structure. Volume 2, New world monkeys. Needham Heights (MA): Pearson Custom. ↑ Wildlife Trust, Durrel Concervation. "Golden lion tamarin | Durrell Wildlife Concervation Trust". Durrell Wildlife Conservation Trust. Retrieved 26 March 2012. ↑ Kierulff MCM, Rylands AB. (2003) Census and distribution of the golden lion tamarin (Leontopithecus rosalia). Am J Primatol 59(1): 29-44. ↑ Kierulff MCM, Rambaldi DM, Kleiman DG. (2003) "Past, present, and future of the golden lion tamarin and its habitat". In: Galindo-Leal C, de Gusmão Câmara I, editors. 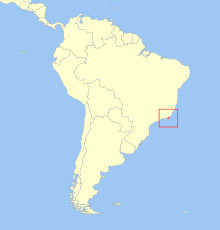 The Atlantic Forest of South America: biodiversity status, threats, and outlook. Washington DC: Island Pr. p 95-102. ↑ Rylands AB, Kierulff MCM, de Souza Pinto LP. (2002). "Distribution and status of lion tamarins". In: Kleiman DG, Rylands AB, editors. Lion tamarins: biology and conservation. Washington DC: Smithsonian Inst Pr. p 42- 70. 1 2 3 4 5 Kierulff MCM, Raboy BE, de Oliveira PP, Miller K, Passos FC, Prado F. (2002) "Behavioral ecology of lion tamarins". In: Kleiman DG, Rylands AB, editors. Lion tamarins: biology and conservation. Washington DC: Smithsonian Inst Pr. 1 2 3 Dietz JM, Peres CA, Pinder L. (1997) "Foraging ecology and use of space in wild golden lion tamarins (Leontopithecus rosalia)". Am J Primatol 41(4): 289-305. ↑ Facts, Monkey. "Golden lion tamarin". Infoqis Publishing Co. Retrieved 26 March 2012. ↑ "About golden lion tamarins - National Zoo". National Zoological Park. Retrieved 26 March 2012. 1 2 Dietz JM, Baker AJ. 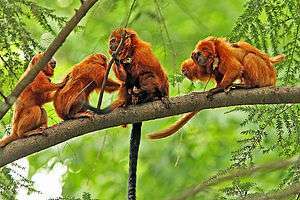 (1993) "Polygyny and female reproductive success in golden lion tamarins, Leontopithecus rosalia". Anim Behav 46(6): 1067-78. 1 2 Bales KL. 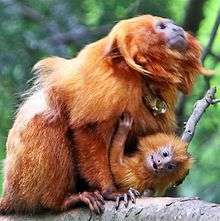 (2000) Mammalian monogamy: dominance, hormones, and maternal care in wild golden lion tamarins. Ph.D dissertation, University of Maryland. ↑ Baker AJ, Dietz JM. (1996) "Immigration in wild groups of golden lion tamarins (Leontopithecus rosalia)". Am J Primatol 38(1): 47-56. ↑ Baker AJ, Bales K, Dietz JM. (2002) "Mating system and group dynamics in lion tamarins". In: Kleiman DG, Rylands AB, editors. Lion tamarins: biology and conservation. Washington DC: Smithsonian Inst Pr. p 188-212. ↑ Peres CA. (2000) "Territorial defense and the ecology of group movements in small-bodied neotropical primates". In: Boinski S, Garber PA, editors. On the move: how and why animals travel in groups. Chicago: Univ Chicago Pr. p 100-23. ↑ Ruiz-Miranda CR, Kleiman DG. (2002) "Conspicuousness and complexity: themes in lion tamarin communication". In: Kleiman DG, Rylands AB, editors. Lion tamarins: biology and conservation. Washington DC: Smithsonian Inst Pr. p 233-54. 1 2 Kleiman DG, Hoage RJ, Green KM. (1988) "The lion tamarins, Genus Leontopithecus". In: Mittermeier RA, Coimbra-Filho AF, da Fonseca GAB, editors. Ecology and behavior of neotropical primates, Volume 2. Washington DC: World Wildl Fund. p 299-347. 1 2 French JA, de Vleeschouwer K, Bales K, Hiestermann M. (2002) "Lion tamarin reproductive biology". In: Kleiman DG, Rylands AB, editors. Lion tamarins: biology and conservation. Washington DC: Smithsonian Inst Pr. ↑ French JA, Bales KL, Baker AJ, Dietz JM. (2003) "Endocrine monitoring of wild dominant and subordinate female Leontopithecus rosalia". Int J Primatol 24(6): 1281-1300. ↑ Tardif SD, Santos CV, Baker AJ, Van Elsacker L, Feistner ATC, Kleiman DG, Ruiz-Miranda CR, Moura AC de A, Passos FC, Price EC et al. (2002) "Infant care in lion tamarins". In: Kleiman DG, Rylands AB, editors. Lion tamarins: biology and conservation. Washington DC: Smithsonian Inst Pr. p 213-32. 1 2 Wheat, Sue (1 September 2001). "Primate concern, protecting golden lion tamarins". Geographical. Circle Publishing Ltd. Retrieved 26 May 2012. ↑ "Leontopithecus rosalia". UNEP-WCMC Species Database: CITES-Listed Species. UNEP-WCMC. Retrieved 26 May 2012. Associação Mico-Leão-Dourado (Golden Lion Tamarin Association) A Brazilian NGO working on golden lion tamarin conservation.